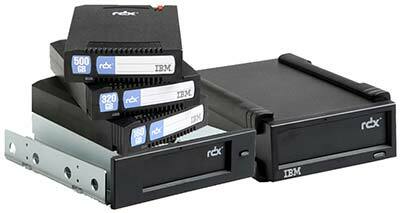 The IBM RDX solution provides all the benefits of disk, with fast random access to data and drag-and-drop functionality, plus the historic portability and durability benefits of tape. Designed for portability and longevity, the rugged RDX cartridges are engineered for durability, so you can safely transport offsite while also providing the shelf life required for archival requirements. Ideal for small and medium business or distributed IBM System x and IBM BladeCenter S environments, the new IBM RDX removable disk backup offerings deliver the flexibility, simplicity, performance and capacities required ina data protection solution.